Using a restaurant.com coupon, Dan and I headed over to Towson's Kabob Hut for some of our favorite cuisine. The place itself is quite dingy, in fact, it wouldn't hurt them to paint the walls or redo the floors, but I am guessing that most of their business is carry-out so they probably don't feel a need. But Dan and I stayed in to eat, and these things bothered us slightly, not to mention the man at the counter was a bit grouchy.....but I won't go there. Regardless, we came for the kabobs. I ordered Hummus ($5.25) which tasted EXACTLY like Sabra hummus, though the employee said it is made on-site. You get a LOT of hummus, so be prepared to share, which is good for a price like that. I wish that we recieved that as soon as we sat down, but it actually came out with the meal, so I didn't spend too much time on it unfortuately. Dan and I both decided to go for some traditional dishes, platter style - which means they come with rice, a little pot of pickled veggies and some yogurt. Dan chose the Beef, Chicken and Tenderloin Platter ($16.95) and I chose the Lamb Kabob Platter ($12.95). I personally thought my lamb was a bit tough and I grew tired of chewing it after the second chunk, and we agreed the Tenderloin was the same. The chicken was tender and good, but plain - Dan really loved it though. I really liked the Koobideh, or ground beef as it was the most flavorful. I would probably get this meat again. The rice was great, but very buttery! For my tastes, I was happier with the simpler foods, such as the chicken and beef kebabs. 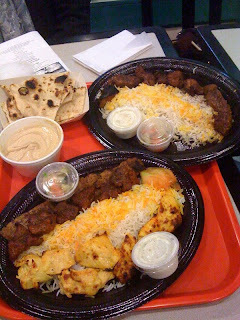 I know I would definitely go back and order just the Koobideh next time, and maybe in a pita to try something different. I'm glad you use it! I seriously use it all the time! Are You a Tea Drinker?